You must make reservations at least 5 minutes in advance of the time at Copperwood Tavern. Surrounded by five available parking garages and one surface lot, all offer free retail parking on specified levels. Metered street parking is available, located on South Randolph Street and South Quincy Street. 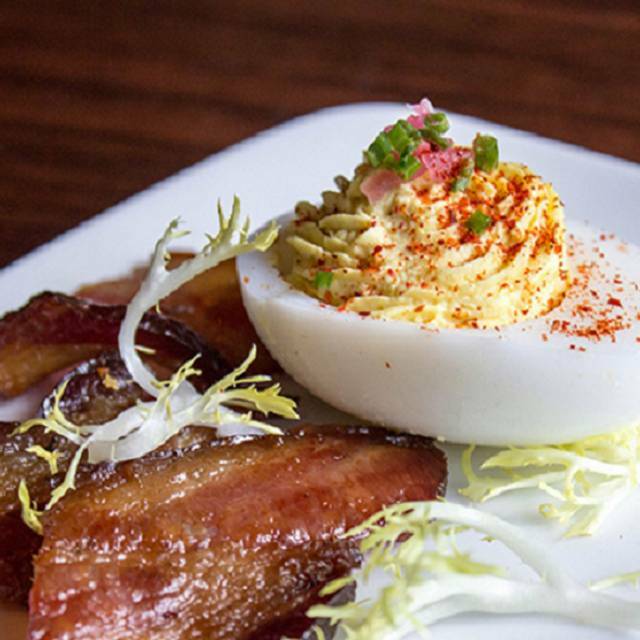 Farm-to-Table American Restaurant serving the freshest locally sourced product available. We are passionate about supporting local farmers and educating people on the importance of a quality product. 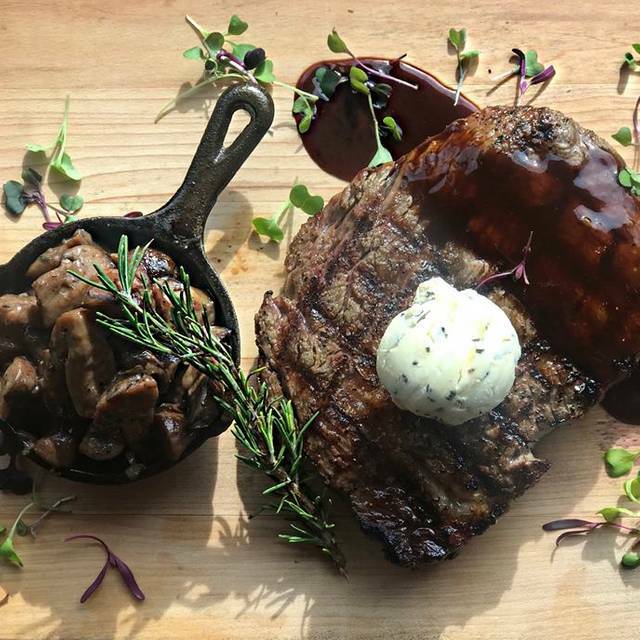 We take pride in offering the freshest quality dishes by serving locally sourced meats, seafood, and produce. We offer 20 local draft beers, 30 small-batch whiskeys, and a superb wine selection. We also enter every lottery for one off bourbons resulting in multiple offerings that you can’t get in Virginia. Our 30-foot craft bar is also stocked with Southern Virginia's white whiskey. Yes, we mean moonshine! 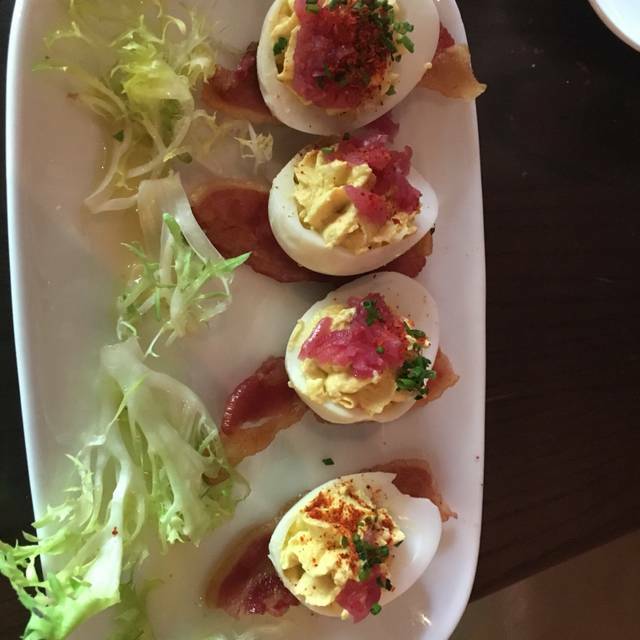 Whether it be date night, a business lunch, or a fun brunch with family - you can count on us! From the time you arrive to the time you leave, expect exceptional service in a cozy cabin-style vibe. Leave us a review about your experience and we’ll send you a gift card for your next visit. 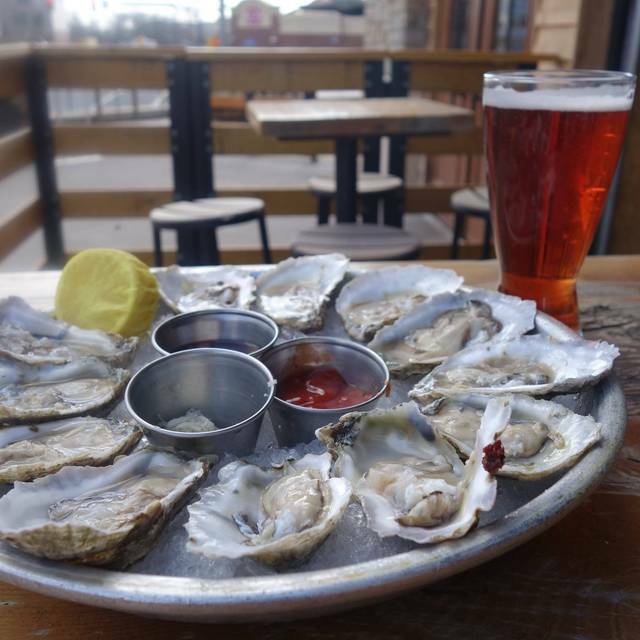 Enjoy $1 Oysters, grilled or chilled, during Happy Hour from 4pm-7pm! Copperwood has a menu we both like. The food is always good and fresh. I had the smoked salmon bagel, and my husband had Bananas Foster French Toast. Both were quite tasty. The staff is attentive and friendly without overdoing it. 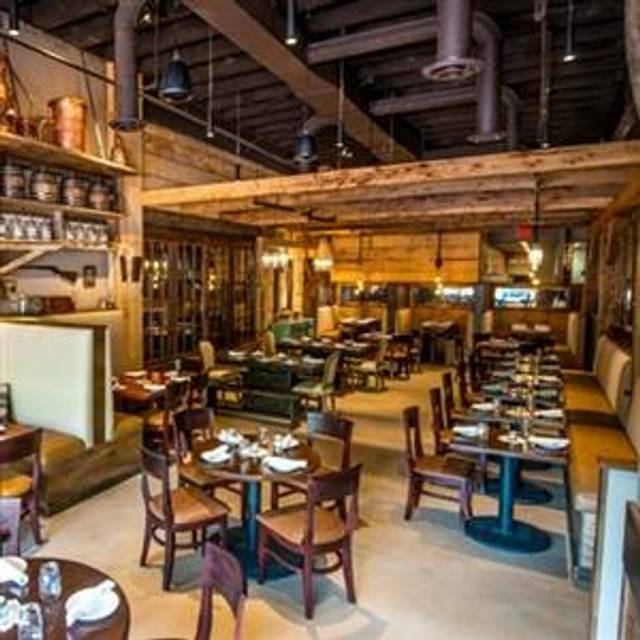 Copperwood is becoming a ‘go to’ spot in Shirlington for us. Overall was okay; service good but food was just okay. Most of the food seemed bland and lacked seasoning. Best thing was the sweet tea. I ordered the steak omelet which came with home fries. The omelet was by far the smallest I've ever seen. It was filled with mushrooms, hardly any steak and only one thin slice of cheese. The dish was not worth $18. Our waiter was not attentive, never returned to table when food arrived to ensure food was prepared to our liking. First and last time coming to this establishment. Our server was great! The food was fast, warm and delicious. Not a fan of the interior decor-a personal preference. Otherwise, we will return. The food was good, but the service was annoying. Throughout our one-hour dinner, we had the server, busboys, even managers coming over and trying to remove plates, glasses, etc when we were STILL EATING AND DRINKING. I lost count after the 5th time someone approached and tried to take my plate when there was still food on it. A manager came by and picked up my wine glass (still holding wine) asking if I was done with it. NO! The pork chop was excellent -- although a bit undercooked. We ordered it medium, it came medium rare. The rockfish was delicious but a VERY small portion. I like this place and the food is consistently good. But they really need to work on being unobtrusive and the basic skill of knowing when people are done eating. Great place to go before a performance at Signature Theatre (walking distance to theatre, plenty of nearby parking). Food is interesting and tasty. Service is attentive and accomodating. Looks to be a very popular neighborhood place. Good menu. Great happy hour deal on oysters. The food was cold and did not taste good. It’s also pretty expensive for what it is. Won’t be going back. I love coming to copperwood. I love the food, the ambiance and the services. As soon as I walked in the hostess was smiling and greeted me, I felt welcomed and she gave me a good place to sit. Her name was Frances, she recommended me to try the ribeye and mash potatoes. She stated that adding herb butter to the mash potatoes was really so I decided to that and it was delicious. The server Jesse was phenomenal, was so nice to my husband and I through the whole time. He stated that Tuesday’s were known as sweet Tuesday’s and if we got entrees, we would automatically get a free dessert and it was amazing. Thank you Copperwood for always treating me so right. The food was average. Every dish we ordered needed more seasoning and the service was not the best. The table was so sticky I had to put a napkin over it. I had to PULL my fork off of the table because it was so sticky. It wasn't something that could be cleaned -- it was as if the finish was coming off of the table. What a disappointment. We reserved seats for date night. We learned, to our surprise, that the full menu was not available where we were seated. Sandwiches can be ordered only if sitting in the bar area or outside. We ordered more food than we could eat. However, the pork chops and chicken dishes were delicious. Our meal was disrupted by a middle-aged couple who insisted on playing videos on their phones with the sound turned up to a level where my date and I could scarcely hear each other talk. The man had a toothpick hanging out of his mouth. 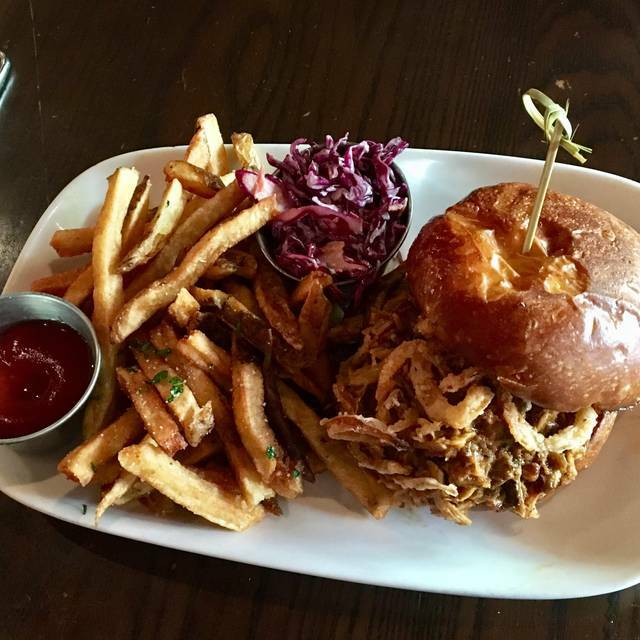 There are much better options in Shirlington in terms of quiet conversation and diverse menus (including sandwiches). So, why go here? We won't return. Our server, Marcos, was nothing short of fantastic: wise, funny, and personable. He didn't hover or try to rush us, but offered suggestions, stories, and a lot of smiles. The food from the seasonal menu was wonderful. We had the mussels and fried green tomatoes appetizers; the venison and the rockfish entrees; and the grilled asparagus and fries as sides. Excellent people and food experience; highly recommended for a guys/girls night out, as well as date night. We will be back! Everything was great. Service,food and easy to find parking. The rack of lamb with cauliflower mash and blackberries, was amazing. The Mountain Blossom drink was excellent. I have to try it again to really rate the service. My experience has been that on casual places like this, sometimes the service is not to par with the price and the food. It was early evening and I had to ask for my candle to be lit. I noticed that tables outside had pop corn. I was served a very nice corn muffin, but practically had to ask for it. Will be back, hopefully the service is better. Excellent service and the food was awesome! You need to try it for yourself, of course! I had the Lobster lettuce wraps and asparagus side. All was delicious. However, the wine I ordered was not yet chilled @$9, so had to accept the wine that was at $12 per glass. I was unhappy at not getting a credit for their failure to have the menu wine chilled and paying for it. The server was really great, though (Elliot) and the Lobster lettuce wraps with avocado and other great flavors were terrific. 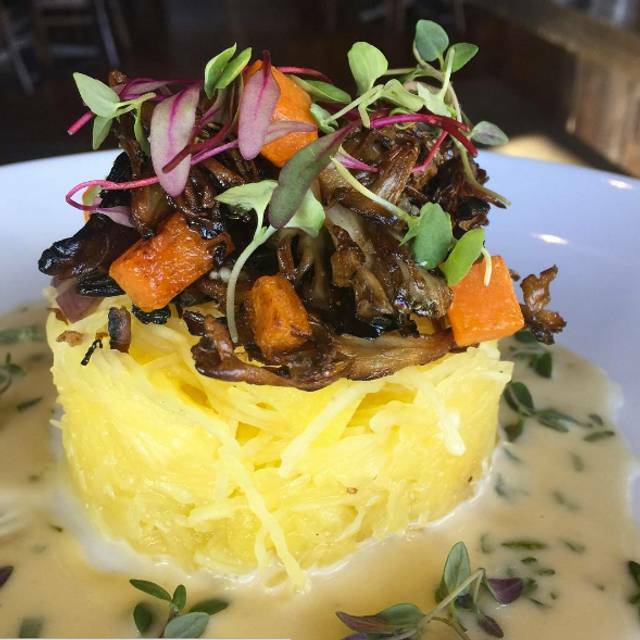 My friend ordered the spaghetti squash dish and loved it, cleaning her plate! The wine killed my bill though. Wonderful service and food; was disappointed that something I wanted was unavailable. Means I'll have to return! The Slow Braised Short Rib Grilled Cheese was incredible! Food and service are hit-or-miss. Parts of my food order never arrived although I inquired about them a couple times, but the waitress did make sure to remove them from my bill. Service was quite slow, possibly because of the Sunday brunch rush. The french toast sticks are always burnt when I order them here. 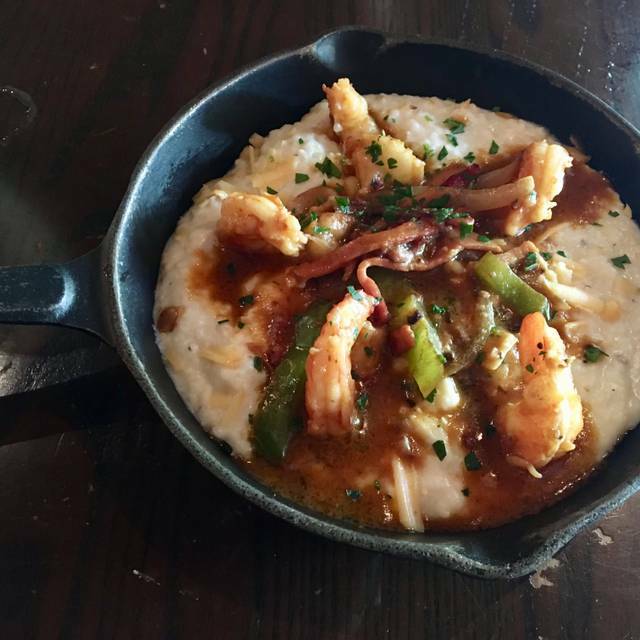 The shrimp and grits, and chicken and waffles dishes are usually good. Cute decor, though. The BALT (bacon, avocado, lettuce and tomato) is a must! It is so scrumptious and has fried green tomatoes on it. You're welcome. Also, Marcos was the best waiter ever. Will definitely be back for brunch again soon. Great!. Need more salt and seasoning on food though! The food wasn’t spectacular and had very little to no seasoning. The service was very slow. Not going back. Lobster lettuce wraps are a must have. I would go back there solely for those! Perfect date night with friends! Food and service were amazing! We tried the rack of lamb with cauliflower mash and blackberries, the duck breast with greens and bacon, the asparagus with garlic aioli, and the venison meatballs. Everything was fantastic. The prices are a bit steep, but the quality and ingredient sourcing make those prices worthwhile. We also had some excellent service — especially so when my date decided she didn't want to eat her lamb quite as rare as it was originally delivered (a shame, I know), so they cooked it a little longer for her without hesitation. The two of us sampled each other's entrees, and I can verify that even when it's a little more well done, the lamb was still fantastic. I really enjoy the opportunity to eat here. I have been here a few times -- I don't find the menu particularly interested and my food has been served cold at least twice. I only go if I can't get in somewhere else. I love the atmosphere. Food was delicious. Me and my Sisters came for brunch. Family friendly. Brunch was really good. The service was great. Scott our server made sure everything came out the way we wanted. Having an early dinner, we opted for something light and ordered farm fresh salads with grilled shrimp. Everyone enjoyed the generous beautifully presented salads - since it was St.. Patricks weekend, my husband had the Irish stew special which was quite tasty down to the last droplet! Always a good time at Copperwood Tavern! Excellent food, cocktails to live for and the most courteous attentive service ever! Highly recommend! Highly expensive, average food, dirty interior. Service was great and food was delicious. Great selection of local beer AND liquor. Love the outside patio but the inside is fun too. This was my first time at Copperwood and I was pleasantly surprised. Food was awesome and I really loved the décor, especially all of the candid pet pics that line the hallway at the restrooms. I felt it was a little pricey, but not crazy and in the end, worth it. It was a great night out, and we'll definitely go back. Our food was good but not great. The French Toast sticks (appetizer) were very oily but my omelet was perfect. The restaurant is very loud and the table are close together so you hear several conversations at once. 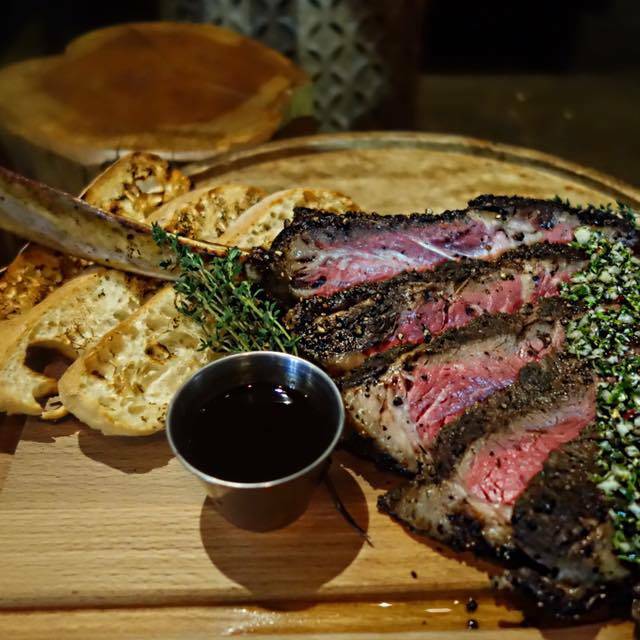 Copperwood Tavern is my go to restaurant when entertaining out of town guests. The food is on point as are the cocktails. We had side of the truffle Mac n cheese and Brussel sprouts to share. Great quality rib eye cooked perfect and to top it off cheese cake for dessert! On vacation. Really enjoyed our breakfast here. Great as usual! We have been multiple times and it has always been good.